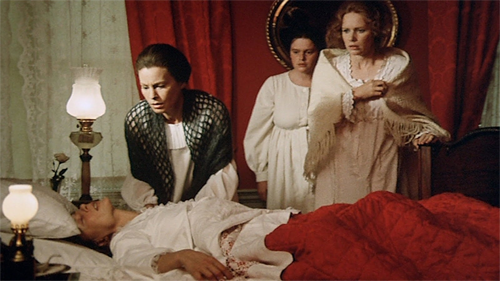 No horror movie can come close to the fear, dread, and dark hatreds of Ingmar Bergman’s great chamber drama, Cries and Whispers. To watch it is to face the end of a slow and painful death by cancer. But that’s not all. This film, centered around four women and set almost entirely in one house, forces you to face the neglect and out-and-out cruelties with which we treat those who should be closest to us. This is not escapist entertainment. Agnes (Harriet Andersson) is in the last stages of a long decline. She’s weak, terrified, and often in horrible pain. Her two sisters–who can barely stand to be in the same room with each other–have come to the family home to help ease her passing. How do you face the death of someone you love? Or worse yet, someone that you think you should love, but there’s very little love in your soul. One suspects that life has been easy for the stunningly beautiful sister Maria (Liv Ullmann). So easy, in fact, that she doesn’t know how to react in a crisis. When she watches someone’s suffering, she doesn’t rush forward to help, but holds back and cries. A respectable, upper-class wife and mother in late 19th century Sweden, she’s as immature and flirtatious as a teenager. The other sister, Karin (Ingrid Thulin), is almost her polar opposite. She’s cold and remote. She does what she has to do, and behaves properly. But she can’t stand impropriety or physical contact. The fourth woman is the household maid, Anna (Kari Sylwan). She’s been with the family for years, and spent many of those years nursing Agnes through her long illness. Unlike Maria and Karin, Anne truly loves Agnes. When Agnes complains of being cold, Anne crawls into her bed to keep her warm. Were they lovers? Hard to say. When Anne cuddles Agnes, the image is closer to a mother comforting a small child. The confined story appears to happen over a few days. Flashbacks provide some backstory, and introduce us to Maria’s and Karin’s husbands. But even these take place in the family estate. You can recognize the interior of the house easily; everything is red–walls, carpet, curtains, and furniture. At the end of a scene, the film fades not to black, but to red. It’s a strange choice, but the right one. All of that red produces a sense of blood, of passion, and of the womb. 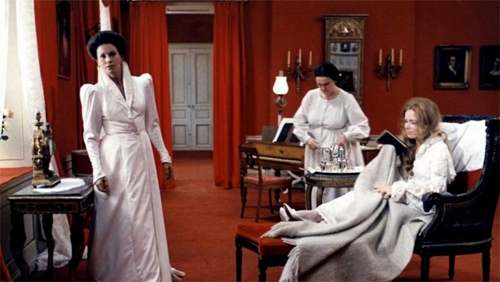 Thank cinematographer and long-time Bergman collaborator Sven Nykvist for those reds. He allows the crimson to dominate the image, without it ever looking false or getting out of control. Nykvist clearly deserved the Oscar he won for this picture. As you would expect, Bergman drew brilliant, loving, yet horrifying performances out of the four leads. When we first meet Agnes in an extended close-up, Andersson’s eyes look directly into the camera with a fear that we all must experience when we face our mortality. When Maria attempts to seduce a former lover (Erland Josephson), her face shows a combination of lust, fear, and pride, confidence, and a deep uncertainty. I’d have a hard time naming another drama as intense or emotionally realistic as Cries and Whispers. And yet it flies by like an action movie, and has scenes that could have come out of a horror film. When you open the case, you’ll find, along with the disc, a fold-out dominated with an article by Cambridge professor Emma Wilson named–believe it or not–Love and Death. When you’re dealing with such dark matters,the comic reference is appreciated. Like all Criterion Blu-rays, the disc comes with a timeline so you can bookmark favorite scenes. When you insert the disc into a player on which you played that disc in before, you’ll have the option to get back to where you left off. Nykvist didn’t win that Oscar for photographing pretty pictures. Or sharp ones. Cries and Whispers uses defused light and soft focus. In other words, this isn’t the movie you use to show off your cool HDTV. But the transfer does its job. Those ubiquitous reds are deep and rich, yet never bloom out of control. The atmospheric lighting, usually replicating sunlight or oil lamps, does exactly what it’s supposed to do. Neither Bergman nor Nykvist lived long enough to approve of this transfer, but I suspect that they would. I have no complaints about the uncompressed PCM 1.0 mono soundtrack. It’s the mix that Bergman approved, and it probably sounds as good here as it did in the projection room. It certainly sounds better than it would on a 35mm print with a 1973 optical soundtrack. It also comes with an optional English-dubbed track. I didn’t listen to it. The newly-translated English subtitles are just fine. No commentary track, but still plenty of supplements. Introduction by Ingmar Bergman:1080i; 7 minutes. A subtitled interview from 2003. It’s rather long for an introduction, but it contains some interesting stuff. Harriet Andersson: 1080p; 20 minutes. The actress in conversation with film historian Peter Cowie, recorded in 2012. Quite wonderful, especially the behind-the-scenes footage of the cast and crew goofing off while making this extremely serious film. On-Set Footage: 1080i; 34 minutes. More of that footage, this time with commentary by Peter Cowie. An interesting overview of the film’s production. Ingmar Bergman: Reflections on Life, Death, and Love with Erland Josephson: 1080i; 52 minutes. Interview with director and star from Swedish TV,1999. As I have not yet watched this one. On Solace: 1080p; 13 minutes. 2014 video essay by cinema theorist ::kogonada. Disappointing. His dull, monotone voice suggested a profundity that simply wasn’t there. 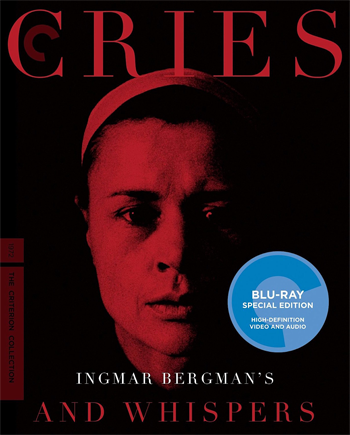 Criterion has done justice to one of Bergman’s best films.